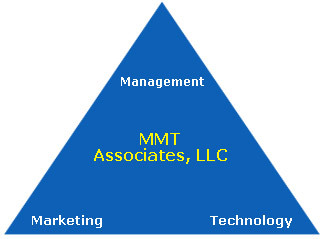 Management Marketing & Technology Associates (MMT) is a management consulting firm that enables its clients to achieve their goals and objectives and become more effective and successful using proven strategies and techniques. Our process begins with an assessment of a client’s current situation to understand the issues they are encountering. As partners, MMT and its clients decide which areas to focus on including sales growth, market expansion, management effectiveness, employee retention, accuracy of public image, lack of innovation, or effective use of technology. MMT’s goal is to use effective means to enhance our client’s profitability irrespective of the client’s type of product or service. The most critical success factor to our clients is to realize tangible results and improvement in their businesses. MMT’s focus on these factors and our partnership with our clients is what makes us unique. We create, implement and manage cost effective strategies that provide measurable results and value to our clients.